Three English teams in the hat for last 16 draw, which takes place on Monday at 11:00 GMT. That's all from us tonight, but we'll back on Thursday for some Europa League action. Fun times. Don't let the lack of a smile in this picture fool you, Mesut Ozil is absolutely buzzing after tonight's win. That's his second tweet containing the word 'Ya' in about 10 minutes. Arsene Wenger on 16 successive years of reaching the knockout stages: "I'm proud of consistency because it demands a lot of effort everyday and I think that's what it's about. We escaped, maybe it's a lucky tear for us in the Champions League. "If you look at the players who were out today and the kind of performance we produced, the performance is absolutely outstanding." The last time Arsenal missed the knockout stages of the Champions League was 1999. It was the year the British minimum wage of £3.60 an hour was brought in. Arsenal have now reached the last 16 in each of the last 16 years. There's probably some readers of this page who were not alive the last time Arsenal failed to progress. Uefa.com reporter Paul Saffer highlights the way Roma sneaked through to the last 16. They placed second to Barcelona in Group E.
Arsenal manager Arsene Wenger speaks in his news conference: "In the last three weeks we lost Coquelin, Cazorla and Sanchez. With all the other injuries not many people gave us a chance. But we are a real team and you could see that today. To score without conceding a goal is not easy. It is a special night for us. We needed something special and when you can deliver that you can create a positive memory for the rest of the season. To top off a pretty good night for Arsene Wenger, he's also come out on top of our vote, with 84% of you saying he will last longer in his current job than Jose Mourinho. Arsenal manager Arsene Wenger: "I told you before that it would be the greatest escape. I must say I'm very proud of the team as we had to be right on the mental and tactical side. At 2-0 we had to push for a third goal, it was too dangerous to stay at 2-0." On coming back in the group: "Nine times out of 10 you are out. We needed something special to come back like we did and tonight we needed a complete team performance. This team really is a team and they showed it again. "You don't need to single Giroud out tonight because he scored the goals. But he showed character again with the penalty." Arsenal's hat-trick hero Olivier Giroud reacts on BT Sport: "It's fantastic for me and for the team. We are really pleased. It's nice to go through because we were not in a good position and finally we have done it. We feel relieved tonight. "In the Champions League it's one level up and we need to be all focused. As a unit, together, good cohesion, defending well and finishing well. It's nice for us. It was not so easy in this stadium with this atmosphere and we are really pleased to have done it. "We want to go as far as we can. The target is to maybe reach at least the quarter final. It's the fourth year I'm here and we have never played a quarter final. We will have a good rest and open the new page of the Champions League in February." Arsene Wenger is talking to BT Sport now, and he says Arsenal played "the perfect game". Hard to argue with that. More from the Gunners boss coming up shortly. Chelsea skipper John Terry: "With our league form being as it is, the fans needed this performance and the players needed it. We gave a big performance, we're delighted. "In the league I think we have lacked a bit of confidence but not in the Champions League. We have been fluent and dangerous and we saw that again tonight. Now we go to Leicester on Monday, which will be difficult, but we need to try and replicate this performance." On Monday's last-16 draw: "We're delighted and lot of team will be fearing us. We will see what comes our way. If we can continue form like that this then it can be a springboard." Chelsea manager Jose Mourinho, speaking to BT Sport: "The players were really committed to get a result, as much for their pride. They didn't want to go to the Europa League and especially after the last defeat at home, a second successive defeat would have been an attack to their pride. Who could Arsenal and Chelsea face? We know who is through, but who could Arsenal and Chelsea get in Monday's last 16 draw? Having qualified second in their group, Arsenal could find themselves facing one of Real Madrid, Atletico Madrid, Barcelona, Wolfsburg or Zenit. Chelsea, meanwhile, have the prospect of a potentially easier last 16 tie, with PSG, PSV, Juventus, Roma, Benfica or Gent their possible opponents. "When people talk about why do managers let players go like Campbell has been let go a few times it's because at a football club, managers see these players day in day out and they see what we don't. "I do believe after tonight he should go on to become a better player because of the experience." Who's through to the last 16? Not the night Gary Neville dreamed of, a 2-0 defeat on his managerial bow sees Valencia knocked out and Gent progress courtesy of their win over Zenit, who also go through. Bayer Leverkusen drew 1-1 with Barcelona, that means they are out. Roma's 0-0 draw with BATE Borisov enough to keep the Italian side second in that group. They progress with just six points. Porto are out, defeat at Chelsea did for them as Dynamo Kiev's win over Maccabi Tel Aviv sees them leapfrog the Portuguese side into second. A turning point for Arsenal? A great night for English teams in Europe, with Chelsea and Arsenal recording convincing wins. Arsenal's was particularly impressive as they weathered an early storm before superbly dismantling Olympiakos. It was deafening in the Stadio Georgios Karaiskaki at kick-off but almost silent at full time. Jose Mourinho's name is chanted by the fans at Stamford Bridge as Chelsea progress with an ultimately comfortable win. The Blues progress as Group G winners, with Dynamo Kiev going through as runners-up after edging Maccabi Tel Aviv 1-0. "A lot of the Olympiakos fans in fairness have applauded the performance from Arsenal. It was a 'Plan A' performance. Get the goal, settle the nerves, go again and quite honestly they have won very comfortably. "Beforehand it looked like an enormous achievement but they have all be outstanding. Yet another year in the Champions League final stages." CHELSEA ARE INTO THE CHAMPIONS LEAGUE LAST 16 AS GROUP G WINNERS. A last chance for a consolation for Porto as Yacine Brahimi curls an effort just wide. Three minutes of added time at Chelsea as Loic Remy comes on for a stretch of the legs, replacing Eden Hazard. Jose Mourinho's side are minutes away from having their status as group winners confirmed. "Giroud's first goal was the most important. It gave Arsenal belief and they have been in control since." "Well done Joel Campbell. Started on one wing, changing to the other. Very good. Very, very good." The 90 minutes are up and four minutes of added time are shown on the fourth official's board. Alex Oxlade-Chamberlain comes on for Joel Campbell, who is gets a big cheer from the away fans for his efforts. Olivier Giroud also goes off, Calum Chambers replacing the hat-trick man. "A shake of the hands for Diego Costa from Jose Mourinho as he comes off. Costa led the line well. It was his initial shot which led to the opening own goal. Chelsea going through as group winners." You can listen to reaction from Stamford Bridge and Athens on BBC Radio 5 live now. Click 'live coverage' at the top of this page. No goals for Diego Costa tonight, but he has led the line well and has put in a cracking shift. Chelsea fans show their appreciation for the striker when he is subbed off, giving him a standing ovation as he is replaced by John Obi Mikel for the final five minutes. There was a lot of unhappy callers on the football social last night. Give us a call on 0550 909693 or tweet @5liveSport or text 85058. Which players have got Champions League hat-tricks in an Arsenal shirt? What company Olivier Giroud joins. Thierry Henry, Danny Welbeck and err... Nicklas Bendtner. Eden Hazard slams a shot against the foot of the post as Chelsea attack again. Porto, at the moment, are dropping into the Europa League, but any last-minute drama looks a million miles away with their players seemingly desperate for the final whistle. Oscar goes off to a standing ovation and is given a hug and a handshake by Jose Mourinho. A rare good night for the Blues. "He looks like he's come of age tonight Joel Campbell." "It's turning not a horrible night for Gary Neville, Alexandre Lacazette runs clear to score, totally against the run of play." Olivier Giroud will grab the headlines, but Joel Campbell has been superb tonight, some great runs and touches. His part in Arsenal's second was a particular highlight. Fifteen minutes to go and Theo Walcott's work is done. He is brought off, with Kieran Gibbs coming on as Olympiakos fans start heading towards the exits. Another chance for Chelsea, and it is a cheeky effort from Oscar. He attempts to backheel the ball into the net from Willian's pass but Iker Casillas sticks out a boot to deny him. It would take something absolutely amazing for Chelsea not to go through to the last 16, with Porto needing three goals. Jose Mourinho's side want a big win, though, and Diego Costa has the chance to add a third as he surges forward. He is bundled off the ball just outside the area and looks up for a free-kick, nothing given. Costa slams the ground in frustration. Some hope for Gary Neville as Gent have been pegged back by Zenit - it's 1-1. That means if Valencia can come from behind to beat Lyon, they'll progress. A tall order but maybe a fairytale start? Spanish football writer Mike Holden: "Noise erupts around the Mestalla as news filters through of a Zenit equaliser in Belgium. It's by no means a full house, but all four sides of the ground are rocking right now." "Look at the Olympiakos players. Absolutely deflated." You can almost hear a pin drop in the stadium now - home fans stunned into silence by the Olivier Giroud show. I won't lie. I really did not think Arsenal had it in them to get the result they needed in Olympiakos. It didn't look likely at all for the first 20 minutes, but Arsenal have been clinical. "Rarely have I seen a goal scored which has initiated such silence." No danger of Olivier Giroud missing this one. He sends the goalkeeper the wrong way and his hat-trick - his first for Arsenal - has the Gunners into the last 16 surely. Olympiakos need to score three goals to change that. "He threw himself into block it, turned his head and it's hit his left hand. I think it's a little bit harsh. Where can he put his left hand? He's planting it as he goes down." A quiet start to the second half across the continent. Still Roma's 0-0 scoreline with BATE Borisov will be enough to take them through as Bayer Leverkusen are only drawing with Barcelona. Still Porto are heading out as they trail Chelsea and Dynamo Kiev will move into second in that group, they lead Maccabi Tel Aviv 1-0. Gent are leading Zenit - who have won all five games so far - and if it stays like that, they will join the Russian side in the last-16. Goalscorer Olivier Giroud is booked, the striker shown a yellow card after a foul. Almost a chance for Olympiakos but, luckily for Arsenal, Brown Ideye's control inside the box is poor. In fairness, the cross comes in at pace, but he gets the ball tangled in his feet and it gives Arsenal time to get the challenge in. Simple but very effective. This was how Chelsea rolled last season. Diego Costa (19) bullying defenders to hold up the ball, then bringing in the fleet-footed Eden Hazard (10). Hazard glanced up to pick out Willian (22), who drilled in his seventh goal of the season. And his first that isn't a free-kick! "It was an excellent save but what makes it better is it was going to Cech's right but he saved it with his left hand." Tense, tense stuff at Olympiakos. First, Theo Walcott sees a shot from a decent position inside the area deflected behind for a corner. Could he have done better? Possibly. Moments later, Petr Cech pulls off a big save, stretching out an arm to somehow keep out Kostas Fortounis' strike that seemed destined for the top corner. "Interesting dynamic between the two Neville brothers in the dug out. "Gary - who can't speak Spanish - sometimes needs to turn to Phil - who can speak Spanish - to shout instructions at the players. "Gary may need Phil a lot more in this second half. Valencia have been unconvincing, the locals aren't happy." Olivier Giroud (number 12) won the flick-on just outside the centre circle, then ran into the box and finished with aplomb. Not bad for a man who is struggling with a sore ankle. "Chelsea take a decisive step towards the knockout stages. Relief for Jose Mourinho." A rare beaming smile from Jose Mourinho as Chelsea add a second. Easy as you like for the Blues as Diego Costa holds the ball up from a throw in, plays the ball to Eden Hazard, who in turn spots the run of Willian and sends him clear and the winger drives in low from the edge of the area. Former Liverpool defender on BBC Radio 5 live. "We eulogised about the ball Ozil played in the first half, Joel Campbell has done the same. A wonderful pass to play Giroud in. Brilliant goal by Arsenal. "Now just go through 10 minutes where you do not concede. Don't raise the hopes of Olympiakos." Scenes! Olivier Giroud, moments after taking that knock to his ankle, grabs Arsenal's second that, at the moment, is sending the Gunners into the last 16! Brilliant from Joel Campbell, who holds up the ball inside the Olympiakos area, evades a couple of challenges and feeds a pass between defenders and into the path of Giroud, who fires home. Alex Oxlade-Chamberlain is up and warming up, but Olivier Giroud looks to be good to continue as he runs off the problem and is back on the pitch. Oh not a good start to the second half for Arsenal. Olivier Giroud goes over his ankle when he swings in a cross and he is straight on the ground, grimacing in pain. Javier Hernandez cancelled out Lionel Messi's opener in Leverkusen. It puts the German side on the brink of qualifying but they need a win as things stand. Elsewhere in their group, Roma are level with BATE Borisov. The scores leave Leverkusen and Roma locked on six points as they both chase second but the Italians have a better head-to-head. Back under way at Olympiakos. Chelsea players are just jogging back out on to the pitch now as well. Big 45 minutes coming up. Who will join Manchester City in the last 16? Earlier we asked you what your manager would doodle to pass time in a news conference. David has sent us this take on 'he loves me, he loves me not'. Yes, it was rather head-bendingly up, down, all round last night. Very much twisted melons on the football desk here in Salford. Pressure? What pressure? Everything is going swimmingly for Jose Mourinho and Chelsea so far. They are winning 1-0 and top Group G as it stands. "Gary Neville will have been told about these Valencia fans, he's getting an insight straight away. They are not happy with their team or the referee. Lyon have been the better side, the Valencia keeper making three decent saves. "It's now a subdued atmosphere. As it stands Gary Neville and Valencia are heading for the Europa League, not the last 16." Olympiakos had seven shots on goal in the first half but only one was on target. In contrast, two of Arsenal's four shots were on target. The Gunners are much more threatening where it matters. "It's been a hard fought 45 minutes. Eden Hazard's through ball on 12 minutes, Diego Costa one on one, it was saved but the rebound cannoned in as an own goal. Chelsea have had a couple of other efforts - on the stroke of half time, Iker Casillas just got a touch with his finger tips to deny Costa. "Porto have had three players booked so they must keep their discipline. Rememeber they need to score two goals a things stand to progress with Dynamo Kiev leading in the other game." "If Ramsey was OK he'd walk off. I hope he has not got caught on the old metatarsal. "It took Arsenal a while to grow into the game with such a noisy crowd. Olympiakos started lively but haven;t really looked like scoring. Once they scored the goal, they do look a much better side. At the moment, you'd think Arsenal would score the next goal." So far so good for Arsenal, but possibly some concern over Aaron Ramsey. As the players head towards the tunnel, he is sat on the pitch, before eventually getting up and hobbling off. Injured? Diego Costa is firmly in the thick of things as the first half heads towards a close. He's on the receiving end of a couple of tough challenges, resulting in yellow cards for two Porto players. He then shoots just wide of the far post on the stroke of half time. As this graphic shows, Arsenal's goal came at the end of a sustained spell of possession. This screenshot is taken between 26 and 30 minutes. Arsenal need a second if they are to go through, but they also cannot really afford to concede. They have a lucky escape when Laurent Koscielny swings a boot wildly at Brown Ideye's cross and the ball flies over his own bar. Moments later, Athur Masuako brings a good save out of Petr Cech. "Gnaly Cornet with a lovely finish from the right hand side. A curling effort with his left foot. Gary Neville frustrated. At the moment he and Valencia are heading into the Europa League." Porto are enjoying plenty of possession (60% to be precise), but are struggling to hurt Chelsea. The visitors have not directed a shot on target as Chelsea, shown by our average positions graphic below, are content to stay compact and hit their visitors through pacy counters. Porto are going out as it stands, remember, with Dynamo Kiev leading 1-0 against Maccabi Tel Aviv. "Walcott all over. Absolutely skipped past two tackles great balance, too easy, went to hit it and couldn't hit the target. He needs too many chances to score." Disappointing from Theo Walcott as an attack that started out with promises fizzles out disappointingly. He breaks forward, gets to the edge of the area but fluffs his shot wide. Spanish football journalist Mike Holden at the Mestalla: "Gary Neville hasn't moved from the edge of his technical area yet. He seems to be in continual dialogue with João Cancelo, most probably because he's the only player within earshot. He just also happens to be playing at right-back. No pressure, João." It is still 0-0 in Valencia. Remember though, with Gent leading Zenit, even a win will not be enough for Gary Neville's new side. Javier Hernandez has seven Champions League goals this season. Manchester United only scored seven on their way to a group-stage exit. His Bayer Leverkusen side are still level at 1-1 with Barcelona. They need at least a win to stand a chance of progressing. Arsenal's goal has certainly shaken things up. Olympiakos, passing the ball about with a bit of swagger in the opening exchanges, are letting their frustrations show a bit as feet fly in on Laurent Kscielny as he attempts to take the ball forward from inside his own half. Free-kick, from which Olivier Giroud eventually wins a corner when his cross is deflected behind, but Mesut Ozil's ball into the area is headed away. It has all the hallmarks of Anfield May 26th 1989......win by 2 goals and the arsenal are through. Here's a graphical replay of that Arsenal goal. That is exactly where you want your number 12 when he's called Olivier Giroud. Maybe Jose Mourinho's charm offensive in his pre-match news conference has resulted in some good fortune for the Blues. They almost get lucky again, Oscar's bending shot - after a slick one-two with Willlian - deflects off a Porto body and almost creeps past Iker Casillas. Chelsea are cruising. Denis Garmash has put Dynamo Kiev ahead against Maccabi Tel Aviv, if it stays 1-0 and Chelsea beat Porto, then the side from the Ukraine will be into the last 16 along with the Blues. Lionel Messi fired Barcelona into a lead at Bayer Leverkusen but Javier Hernandez levelled within three minutes. And some bad news for Gary Neville. Gent lead Zenit. A win for the Belgian side means Valencia cannot progress, even with a win. Not in the script. "What an absolutely fantastic reverse pass by Ozil. The only player on the pitch capable of doing so. A great cross from Ramsey, a downward header, the keeper probably should do better but it was always going to go in." Big goal for Arsenal! Aaron Ramsey gets the ball from Mesut Ozil's brilliant reverse pass and clips an inch-perfect cross to the head of Olivier Giroud and his header has too much power for Roberto, as the ball squirms beyond him and in at the near post. One more goal for Arsenal without reply, and they will go through. A fan of tactics boards? Then you'll love this. Here's how Chelsea's opening goal unfolded, Eden Hazard (10) picking out Diego Costa (19) before Porto keeper Iker Casillas (12) saw his save rebound into Ivan Marcano's chest. Chance! Finally a bit of zip about the Arsenal attack as Joel Campbell gets inside the area and cuts the ball back for Mathieu Flamini, who scoops a shot onto the crossbar. It has taken 25 minutes, but finally Arsenal threaten in the final third. That will give the away fans a lift. Diego Costa can't help himself, can he? The Chelsea striker is winding up his Spain international colleague Iker Casillas, who tumbles to the floor after Costa challenges him for a loose ball. Casillas goes loco, Costa stands his ground. The referee pulls the pair away before the game resumes. It's not going well for Arsenal so far. "The game is just a little bit bitty at the moment, which suits Olympiakos of course. "Walcott is not at the races, he looks short of pace." Olympiakos have so much space when they attack but, luckily for Arsenal their shooting has been off as Felipe Pardo curls a shot wide from just outside the area. Last season the Blues only benefited from four OGs in total in all competitions. Just what Doctor Mourinho ordered. A huge slice of luck has helped the Blues because, before that fortunate own goal, Porto had been shading the contest. Yup, not much sign of them so far. So far so good for Chelsea, but Arsenal have plenty to do. The Gunners are yet to test the home keeper, but are enjoying a bit more possession inside the Olympiakos half. Olivier Giroud heads down a cross inside the area, but fails to find a fellow blue shirt and the hosts clear. "So close to a perfect start for Gary Neville. Mustafi has the ball in the net but it's ruled out. He is a suit manager not a tracksuit manager. He's a manager who will spend the whole 90 minutes on the edge of the technical area." "When you question what the official on the goal line does, he has just done his job. It did cross the line by about a foot in the end." Big goal for Chelsea, and a huge slice of fortune about it too. Diego Costa is put through by Eden Hazard, Costa's shot lacks conviction and is blocked by Iker Casillas, but the rebound deflects off Ivan Marcano's chest a good 12 yards outand goes into his own net. A Porto player tried to keep it out and did hook the ball clear but it had already gone over the line. "Get the number 14 and tell him to track back, lads..."
It is all Olympiakos at the moment. A nervy moment for Arsenal as Kostas Fortounis falls over inside the area. He wasn't even that close to Theo Walcott. The referee blows his whistle, walks straight over...and books Fortounis for diving. Chelsea's defence is worryingly pedestrian. There's no urgency or desire to press as Porto patiently pass the ball around the edge of the area, and it almost proves costly as Yacine Brahimi is given the chance to have a crack at goal at Thibaut Courtois' near post, but the Chelsea keeper is alert enough to thump the ball away. Arsenal have nothing to worry about, Brown Ideye is up front for Olympiakos. He managed seven goals in a season at West Brom before being shipped off to Greece during the summer. Very hostile atmosphere in Athens as every touch of the ball by an Arsenal player is greeted by a chorus of boos. Theo Walcott is clattered as Olympiakos players make their presence known. No clear-cut chances as yet, though. Early chance for Chelsea as Willian swings a free-kick into the area from midway inside the Porto half. It deflects behind for a corner, but it comes to nothing. "I think this stadium is worth a goal start as well as the advantage they already have." Here we go. Games across Europe are getting under way. Tell us or, if you are feeling creative, draw what it would be and send to #bbcfootball. You can also text in on 81111 (UK only) and post on the Match of the Day Facebook page. This is a fancy drawing indeed. We can see Louis van Gaal and assume this is Memphis Depay? Is he handing him over? Giving him back? Will Chelsea and Arsenal avoid following Manchester United out of the Champions League and into Thursday night football? We'll find out soon enough, with kick off almost upon us. "It's quite a sight in this stadium. The teams walk slowly out. I'm watching Petr Cech and Per Mertesacker flexing their muscle. This stadium is wonderfully atmospheric, it's relatively new, there are streamers coming from the back of the stand to the front. Arsene Wenger said it would be hostile and so it is." Don't worry Matt - you're out on your own. Both sets of teams wait in the tunnel, a banner with the words "we rule this land" hangs above the exit onto the pitch. As the players walk out, the home fans hold up white and red flags, with huge cheers as the home team emerges. "The photographers are ready for Gary Neville. A big moment for Neville was a first ever team selection, it contains two changes. It's a must win, Valencia have to beat Lyon. What will he be like in the dugout? The Mestalla - and some of Spain's most volatile support - is ready." Spanish football journalist Mike Holden at the Mestalla: "Two changes from Saturday's 1-1 draw with Barcelona. Ruben Vezo is suspended, so in comes Joao Cancelo at right back. Shkodran Mustafi returns from hamstring trouble and will partner Aymen Abdennour at centre back, meaning Anderlan Santos drops to the bench. Looks like 4-3-3 again." Meanwhile, if Chelsea avoid defeat, they are through. "I think tonight if Jose doesn't get the win his position will be extremely precarious. You cannot underestimate the significance of this game at Stamford Bridge." "If Chelsea do go out of the Champions League this evening I really do think Jose Mourinho is under massive pressure because what will be left for Chelsea to go for this season." "Winning the group is the objective but if in the end we get a draw and qualify that is good. "But we don't plan to start the game with that in mind - we want to win. We know winning is difficult, because this is not a group match now - this is knockout now." On Diego Costa returning to his starting XI: "It's not about Costa, it's about the team. There is a clear contrast between our results and the atmosphere in the squad. I understand people have doubts, but the players want to win. I hope the contradiction ends tonight. "But we need to put the ball in the net which we have not been doing." A final reminder of the Chelsea team. Big night for Diego Costa, can he fire the Blues into the last 16 and ease the pressure on his manager? Chelsea XI: Courtois; Ivanovic, Zouma, Terry, Azpilicueta; Ramires, Matic; Willian, Oscar, Hazard;Costa. A tough day for Garry Monk - but it could end up being a very relaxing Christmas. Arsenal manager Arsene Wenger, speaking to BT Sport: "We have to be brave - it will be hostile against a motivated team who are physically very strong. We need to be committed but disciplined and controlled. "I gave Theo half an hour at the weekend. I don't think he has 90 minutes in his body at the moment but I decided to start him. It's risky, but we need to score goals tonight so it was needed. "We need to produce a top, top, top performance because I think Olympiakos are an under-rated team." Here's a reminder of how Arsenal will line up tonight. It will be interesting to see how far forward Theo Walcott will play, on his return to the side in place of The Ox. Arsenal XI: Cech; Bellerin, Mertesacker, Koscielny, Monreal; Ramsey, Flamini; Ozil, Walcott, Campbell; Giroud. Olympiakos: Roberto; Elabdellaoui, Da Costa, Siovas, Masuaku; Kasami, Milivojevic, Fortounis, Seba, Pardo; Ideye. 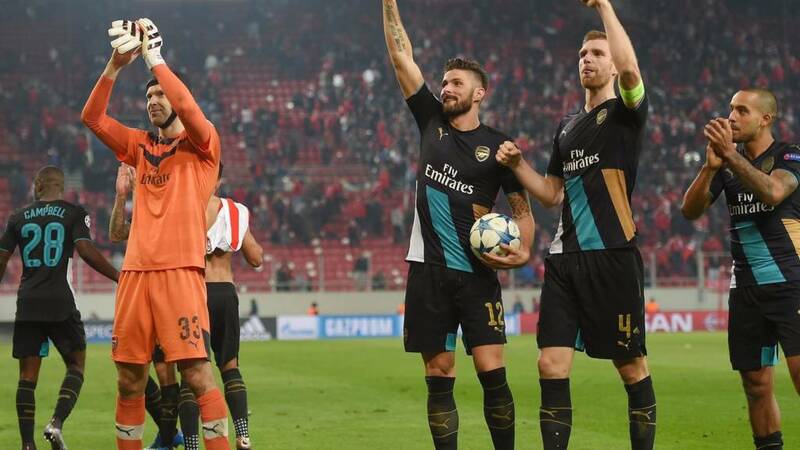 Can Arsenal avoid a slip-up in Greece? They have failed to win there in each of their last five visits. "It is very difficult for Arsenal. If they can get that first goal in the first 25 minutes it will change the opposition's thinking. It will change the dynamics. Suddenly you think 'we can do this'." You can listen to Mark on BBC Radio 5 live now. Arsenal fans may not want to remember their brief European campaign 16 years ago - the last time they failed to reach the last 16 - but Manchester United supporters will be wishing they were partying like its 1999. That was the year they staged one of the most memorable comebacks in football to win the Champions League, beating Bayern Munich 2-1. Nothing memorable about this year's adventure as Louis van Gaal's side failed to reach the last 16 after losing 3-2 to Wolfsburg on Tuesday. All that money spent and they finished their most important game of the season so far with Jesse Lingard, Nick Powell and 18-year-old Cameron Borthwick-Jackson in their side. Madness. What would your manager doodle? Tough gig Kev, tough gig. Diego Costa is currently going through the pre-match warm-ups with the rest of the Chelsea squad. Would the Blues be better off without the striker? That's one of the questions Mark Chapman, Mark Lawrenson, John Murray and the Daily Mail's Neil Ashton are debating right now on BBC Radio 5 live. What do you think? Diego's fault or - as Ashton wrote on Sunday - isMourinho losing a grip? Iker Casillas is in the Porto goal tonight. Could be an awkward encounter if he bumps into Jose Mourinho in the tunnel before kick off. The two fell out when Mourinho was manager of Real Madrid, with Casillas dropped from the side. No doubt he'll have a point to prove tonight. Porto need a win at Stamford Bridge to top Group G - but the Portuguese runners-up have not named an adventurous side. Five recognised defenders, two holding midfielders and no out-and-out striker. A draw will be enough for Porto to finish as group winners, with Chelsea progressing as runners-up - unless Dynamo Kiev win and the Portuguese side are out. Confused? Here's why. Porto XI: Casillas, Maxi Pereira, Martins Indi, Maicon, Marcano, Layún, Brahimi, Herrera, Danilo, Imbula, Corona. "I think it's great for Gary Neville. I don't know him fantastically but I think he will look at the players and give them a chance, regardless of who they are or who their agent is. "It's typical of us to all start saying 'he is the next Manchester United manager' or 'he is the next England manager'. He hasn't even managed a game yet, give the lad a chance." "Neville certainly won't let them down when it comes to hard work. I saw him arriving at the Mestalla today seven hours before kick-off." Nothing like a pressure-free start to life at a new club, in a new country, with a new language and new players and a new role - manager - for the first time. Gary Neville has it easy - win or bust in the Champions League. "It is impossible for me to play down expectation," said the new Valencia boss ahead of their fixture with Lyon. "There's no point in low ambition, I wouldn't be here. I'm focusing on staying calm, doing the work withe the players. It's impossible to get everything into the players in 48 hours." Valencia will reach the round of 16 if they win and Gent fail to beat group leaders Zenit in Belgium.